Chicago filmmaker Ines Sommer has been working on a documentary, called Count Me In, on the participatory budgeting process in Chicago, a movement that has been coordinated by GCI’s own Thea Crum and Maria Hadden of The Participatory Budgeting Project, and is now ongoing in three wards and one Tax Increment Financing (TIF) district. The documentary was recently awarded funding by the MacArthur foundation to air the documentary on PBS. 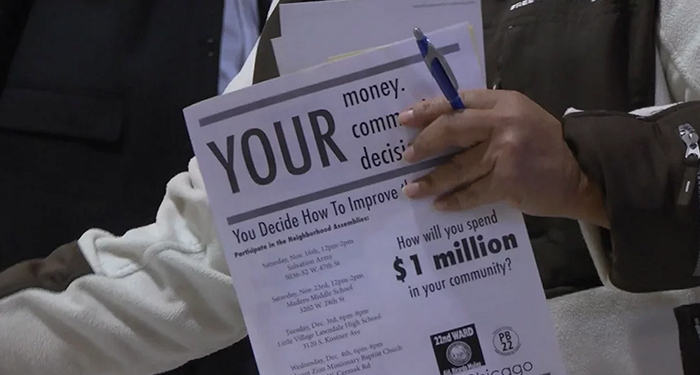 Count Me In examines participatory budgeting in Chicago, the first U.S. city to adopt the practice. Working in collaboration with elected officials, the process allows residents to propose and cast a binding vote for publicly funded projects in their community. The documentary follows ordinary Chicagoans who take part in the process to explore themes of governance, citizen participation, and the possibilities and limits of this form of direct democracy. For a preview of the feature-length documentary, which will air on WTTW Channel 11, check out the MacArthur Foundation announcement.